Focus Guest Chair by Sit On It: The revitalized Focus Side combines comfort and design for multi-purpose, office, or reception areas. Choose either the 4-leg side chair, bar or counter stools in three back options – mesh, upholstered and wood. Two different frame finishes permit it to blend in – or stand out. 300 lb weight capacity, lifetime warranty. Achieve Guest Chair by Sit On It: With its concave back and seat, the Achieve matches the natural curves of the body for ergonomic support with a lean profile for easy stackability and storage. 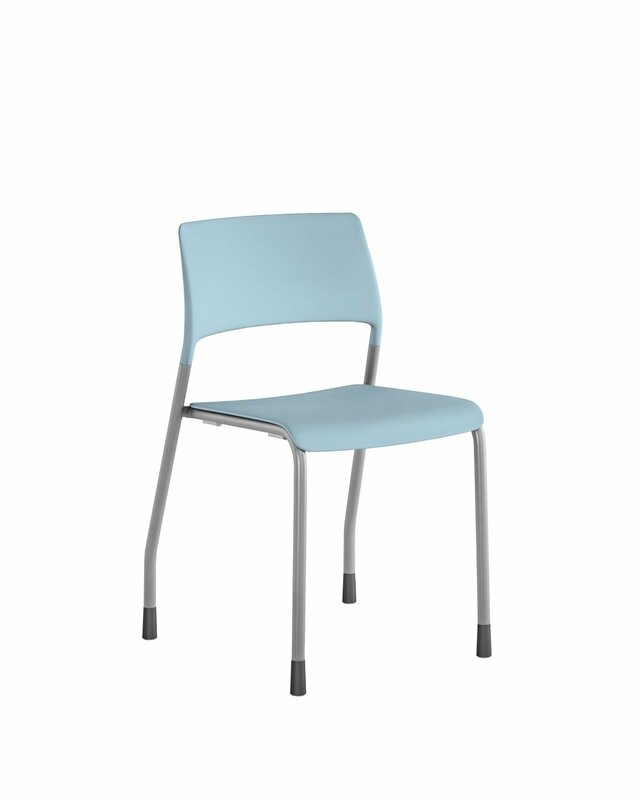 Achieve is perfect for informal meetings, breakrooms or as a side chair. 250 lb. weight capacity, lifetime warranty. Run II Side Chair by Via Seating: Flexible in design, comfortable in sit and suitable to any budget. The Run series delivers breadth of line to cover applications from task, right through to conference and guest applications. Simple to specify, Run offers a generous, single, medium seat size with one mid back size. The mesh back is 4-way stretch which offers great support and comfort and is available in multiple colors. This family of seating offers high performance ergonomics with a great synchro control, conference application with nicely designed loop arm and swivel tilt control and a four-leg frame for guest applications. Multiple arm styles and menu driven options provide opportunity to custom build for any environment. 300 lb weight capacity. Vista Classic by Via Seating: Vista embodies the via seating quality and comfort and offers a distinctive look suitable for a wide variety of environments. The cleverly designed back is sculpted to provide a generous sit and showcases a very attractive, but practical, cut out area. This element provides an interesting aesthetic but also services the requirement for a ‘wipe out area’ for healthcare environments. It can also be used as an easy to access ‘hand grab’ for moving the unit. The Vista series includes a stool frame and a bariatric version. 500 lb weight capacity. Pierce Side Chair by AIS Seating: Pierce is available as a chair as well as a 28.5” (seat height) stool. The Pierce offers clean lines, outstanding fit and finish all resulting in a sophisticated and utilitarian multi-purpose chair and stool at an outstanding price point. The Pierce chair is available in a variety of colors and with casters or glides while the stool is only offered on glides. The chair stacks up to eight on the floor.